One of the things I love most about reading to very young children is their tendency to reach out and touch the illustrations, almost as if they’re soaking up the story and words with their pudgy little fingertips! As they grow older, it seems that they often learn to sit more passively and listen as stories are read to them. Sure, some books invite verbal participation through repetition and other techniques, but more tangible interaction is sometimes missing from books for older children. Happily, there seems to be a trend in book publishing at the moment that invites a more interactive experience. 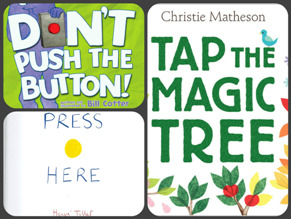 Here are three newish picture books that are begging to be touched! Released in North America in 2011, this book by French author Herve Tullet has enamored teachers, parents and children of all ages with its simplicity, imagination and playfulness. The book invites readers to press dots of various colours and watch as they move, grow, shrink and dance across the page. A simple idea, brilliantly enacted. Instead of a variety of dots, this book simplifies everything down to a single red button. A purple monster named Larry first forbids but then urges readers to push the button, not realizing the zany effects this will have! Interactive, silly and great for read-alouds. This lovely book invites readers to help a tree change through the seasons by tapping, blowing, shaking and rubbing the pages. As buds appear, fruit grows and falls to the ground, leaves change colour and whoosh away, children are immersed in the cycle of the four seasons. Magical and beautifully illustrated. Additional fun interactive picture books in our collection include “Can You Make a Scary Face?” by Jan Thomas and “Count the Monkeys” by Mac Barnett. If you know of others please share below!